Buyer personas. The most important insights into your customer base live in these fictional, but accurate representations of your target buyers. Whether you’re a big enterprise brand or a bootstrapped startup, you need to have documented profiles of the types of customers you are trying to reach. So, you’ve got that down. Now, you want to do it better. You’re in luck. Thanks to high-tech resources and innovations, we have tools in place to conduct top-tier persona research. First, it’s important to continually analyze your personas and periodically make changes as needed. A study done by Cintell found that companies that surpassed their revenue goals were 7.4x more likely to have updated their personas in the last 6 months. By keeping them up-to-date and optimizing them regularly, you’ll discover that your personas more closely represent the customers you seek. You even have the opportunity to bring in more customers, as your accuracy in research improves. This all sounds like every marketer’s dream. But, it won’t happen overnight. It takes time and diligent research to improve your customer personas. However, we’ve got some neat tricks up our sleeve to help you be more creative with your targeting. Here are 3 innovative ways to create better buyer personas. The best and most accurate data you could possibly get about your customers is to actually get the data on your real customers. While marketing automation platforms help marketers track their business, also implementing the use of Google Analytics can help you find the people who are actively engaging with you online. This is a must-have tool for any marketer. You can get a full-scale overview of all the ways your company interacts and connects with people anywhere your brand lives online. For instance, if you sell arts and craft supplies, wouldn’t it be useful to know that a targeted paid social ad was clicked on by a married mother of three and and she later returned to your site to buy from you? Thanks, Google Analytics! Other data such as analytics from the social networks and even social media listening data can help you make the connection between this buyer and who your personas are. Now, you can use this info about a real-life customer in which can help you with your buyer personas. Perhaps, one of your personas is “Samantha”, a stay-at-home/work-from-home mother between the ages of 30-40 whose main passions are art and who reads blogs from other artists. Analytics allows you to see who your audience is and how they discovered you. If you are a SaaS or B2B platform, you can also track exactly what your active users look like on your site and platform. 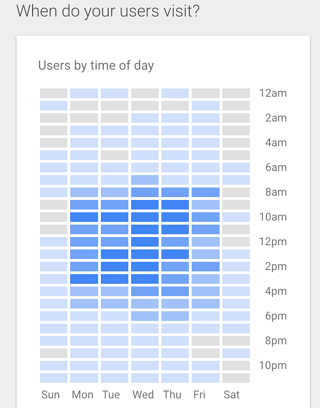 Here you can get data such as demographics, geographics, and behaviors right within the Google Analytics interface. You can use this online usage data to see who is visiting your site, when they were there, what their demographics are, what they are interested in and how the interact and behave online. If you are new to Analytics or you’re looking to get better at it, check out this free beginners course provided by Google here. 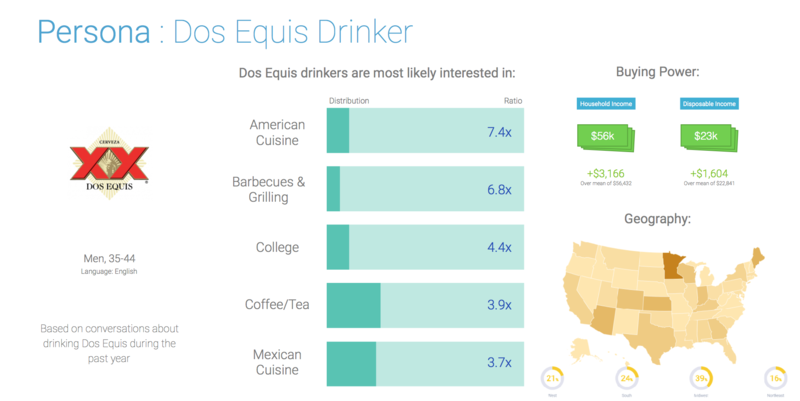 Quantcast is another great resource for marketers to use in their customer research. This free platform provides data around customers such as geography, consumption habits, purchase behavior, household income and even political affiliation. By incorporating Quantcast’s data into your documentation, you can get more specific data points about your customers, enabling you to conduct audience segmentation more accurately. These two platforms give brands more opportunities to discover the right audiences, identify trends in their customer behavior and measure how well you’re reaching your target audience, all key elements of persona development. The takeaway here is this: learn everything about your current customers. The first innovative way to create better buyer personas is to use Analytics and Quantcast to know your customers. That will lead to more accurate persona research. Marketers often miss the valuable resource that’s right there under their own roof. The sales and business development team know your customers and prospects better than anyone. When developing your persona documentation, you should work alongside the sales team and they should be deeply involved in creating your personas. The sales people know all of the problems, concerns, pain points, needs and interests of your customer base. First, they know the attributes of your current customers, which give you a perfect case study and historical record into what type of people have bought from you. You need that information for your customer persona research. Second, the sales team is the most connected to potential customers. They get to hear all of those problems and pain points daily from those who are considering you. So, as you’re gathering the research about people such as demographics, passions and interests using the tools and resources we’ve outlined here, connect those insights with the information your sales team provides to help build your persona profiles. Why are they interested/looking at your product or service? Who is the decision maker on their team? Who is the main benefactory of the product or service? What fears or concerns do they have? What interests do they have, both business and outside of business? What is their typical journey/path to purchase? Your team can also work together to interview current customers. Your sales staff will make an important contribution during these interviews because of their knowledge of both the customer and the product. Set up a meeting or call with a current clients and ask them about their overall experience with your product, what they love about it, how it’s helped improved their lives, and if there’s anything they’d change about it. Answering these questions will help you and your sales team identify trends that will eventually lead you to having a more accurate buyer profile. Google Analytics and Quantcast are great platforms to use on the cheap, but now you need to take your investment in marketing technology further. There are countless other tools that were created for the purpose of customer research. Marketing automation platforms such as HubSpot and Marketo help you see who visits your site, subscribe or otherwise provide you with information about them. Monitor what your visitors and document when and how they become customers and include this information in a section about the typical buyer’s journey in your customer profiles. Search Engine Optimization helps you get discovered. But it also helps you discover your customers. First, you can spy on your competitors. Persona research helps you understand your competitors and, by the same token, competitor analysis helps you understand your customers. Get to know what your audience is looking for and what kind of keywords they are using to find your competitors and others in your industry. Utilize tools like Spyfu, SEMRush, and Similarweb as an innovative way to create better buyer personas. 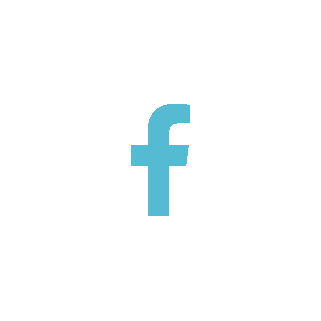 Social media monitoring is a great way to learn about your customers. The individual networks like Facebook, Twitter, LinkedIn, Instagram and others all have analytics tools built within that can help with the development of your persona profiles. Better news: they’ve all improved in the last year so you can investigate even further into your online following. Social media management company Hootsuite has a great overview of how to use social media marketing data to build your buyer personas here. What if you could get fast, accurate, flexible data about your consumers, competitors and influencers in real time? That question led to the ultimate creation of social listening tools, like Infegy Atlas. These platforms help you discover key insights about online audiences from all corners of the web. Go beyond just social media monitoring tools. Use social listening to see how people think and feel, to discover new audiences, gauge reaction and emotion, identify trends in demographic and interest data, and compare your brand to others in your industry. This will help your team develop and update personas intricately and more precisely. Lastly, if you’d like to improve the process or documentation of your personas, look to experts like HubSpot, who’ve created a starter template that’s easy to fill out called “Make My Persona.” You can find it here. One last thing to keep in mind when taking a more innovative approach to buyer persona research is this: always remember the human element of your buyers. Your customers and target customers are people. The point of creating personas isn’t to lock in your targets to only the biographical information you keep there. The people who buy from you won’t 100% adhere to the criteria that you outline in your personas. The goal in creating them is to understand your ideal customer. To use them correctly, remember your customers are humans and no one is exactly like another person. Create your marketing and advertising messages for people, not profiles. In closing: when buyer personas are included in a marketing strategy, that strategy is shown to be 2-5x more effective. So don’t miss out on a big opportunity to connect with customers. 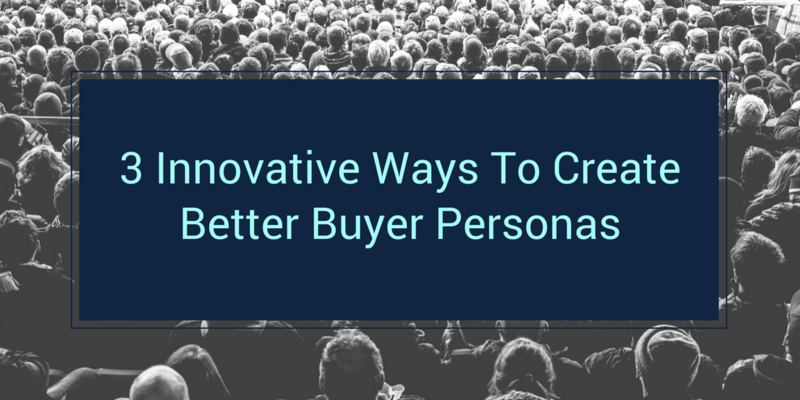 Implement these innovative buyer persona hacks to better understand your audience.